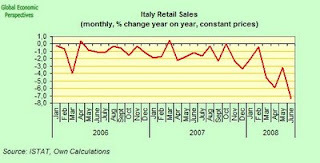 Italian Economy Watch: Have We Seen "Peak" Italian Retail Sales? Have We Seen "Peak" Italian Retail Sales? Well, since Ugo Bardi recently raised the question of whether Italy had not in fact passed its own historical "peak oil" and "peak mafia" points, I thought it might be interesting to ask what else has peaked in Italy, and what better place to start than with retail sales? Italian retail sales fell sharply in June, posting their sharpest drop on the year in more than three years, as sales fell across the board, according to data last week from the national statistics office Istat, but what many observers seem to fail to be taking note of is that Italian retail sales have been dropping steadily for some years now. Even more importantly - as will be argued in this post - there are serious theoretical grounds (in the context of Italy's ageing population problem) for postulating that Italy's retail sales may NEVER rebound again on more than a conjunctural basis, that is we may see local "peaks" and "troughs" but the secular decline may now not reverse. This is a point which most of consensus analysts who look to a cyclically driven "rebound" in domestic consumption appear to fail to take into account. But before going further with this point, let's take a look at some data. 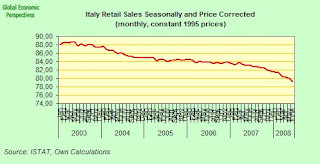 Compared with June 2007, Italian retail sales fell by 3.4% on a current price (ie non inflation corrected basis), thus registering the steepest decline since April 2005, following a 0.5% rise in May. But since annual consumer price inflation stood at a 4% in June, retail sales in real terms declined very sharply indeed in June (more or less comparable to Spain). Per una migliore interpretazione degli indicatori qui presentati occorre considerare che essi si riferiscono al valore corrente delle vendite e incorporano, quindi, la dinamica sia delle quantità sia dei prezzi. (Which loosely translated say that in order to better understand the data it is important to bear in mind that it refers to the current price value of sales and thus incorporates both the volume and the price dynamic. Of course, to help us better understand the data it would be nice if ISTAT could provide us with some price corrected index, but in the absence of this I have prepared a rough and ready one, but deflating the seasonally adjusted index with the CPI one, thus reducing the sales index to 1995 prices, see charts which follow). Now applying the CPI deflator to the index in fact gives us reading which match quite closely the Bloomberg PMI data for retail sales. The latest Bloomberg eurozone Purchasing Managers' Index, based on a mid-month survey of economic conditions in the euro area retail sector, pointed to a continuing contraction in retail sales across the eurozone for the third consecutive month in August. While the PMI rose to a three-month high of 47.7 it remains below the crucial 50.0 zero growth mark. There was some, however, some variance in retail sales trends across the three largest euro area economies. Italian sales continued to fall, extending the current period of month on month consecutive declines to a year-and-a-half. However we did hit a nine month "high" with sales contracting at the slowest pace since last November, rising to 44.8 (or minus 5.2) from 38.2 (or minus 11.8). Thus August revealed a significant eeasing in the rate of contraction (a finding which is completely in harmony with the rather better consumer confidence index reading for August. Indeed the fall in Italian retail sales in August was not as strong as the one in Germany, where the rate of decline - 44.1 - accelerated to its strongest pace so far this year. 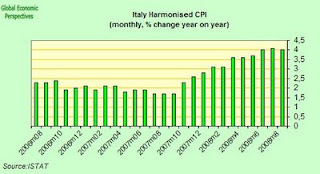 So things in Italy are bad, and they are getting worse, but they are now getting worse more slowly than they were. The fact that in August oil prices were significantly down from the July peak obviously has something to do with this situation. The August PMI data also revealed a rather higher level of pessimism amongst retailers with regard to September sales, with the index for the sales outlook registering 48.0, down from 49.5. The data revealed some variance across countries, while French and Italian retailers expect sales to come in below target next month, which reflects underlying concerns that the economic downturn will continue, German retailers were more positive, forecasting a stronger than previously expected performance. Indeed Italian consumer confidence bounced back in August from a 15-year low in July as oil prices fell from record highs. The Rome-based Isae Institute's index, calculated from a survey of 2,000 families, rose to 99.5 from 95.8 in July. The index, however, continues to remain at a very low level. So the question we are faced with now, is whether or not we are faced with a "peak" retail sales phenomenon? The theoretical basis for this assumption is on reasonably solid ground, and there is evidence to show the phenomenon exists in other ageing economies (Germany, Hungary, possibly Japan). 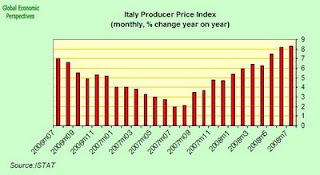 In the Italian case, I have constructed my own makeshift index, and the performance of this index since 2003 can be seen below. 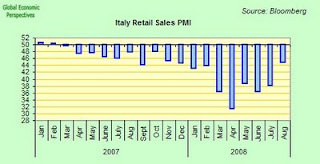 It seems Italian retail sales may have "peaked" in early 2003, and since that time the decline has been continuous, although sales did stabilise during 2005 and 2006 (I will come to this point later). Now Italy's population is not in fact contracting at this point, although the natural population change is negative, and has been since 1993. 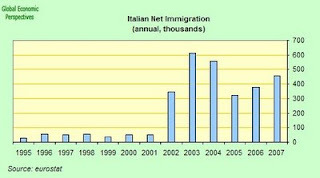 But Italy has been receiving immigrants - an estimated 450,000 in 2007 - and thus Italy's population is still increasing. But Italy's population is ageing, and we know from basic life cycle theory (Modigliani) that saving and spending patterns change across the life cycle, with the propensity to borrow against future income in order to buy now declining significantly among the over 50s, and since it is increasing consumer credit that drives retail sales growth in the dyamic internal consumption economies, then it is highly likely that ageing will now act as a drag on sales growth in countries like Italy with very high median population ages (43, along with Germany and Japan). 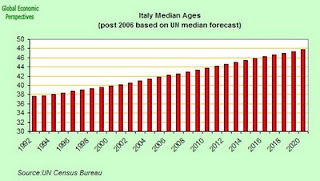 As we can see in the chart below (which comes from the US Census Bureau database), Italy's median population age has been rising steadily, and at a very rapid rate (over 1 year's increase in median population age for each calendar year, of course historically this type of rapid ageing is quite unprecedented), with the only real substantial unknowns between now and 2020 being life expectancy, which may accelerate more than anticipated (in which case the population ageing will be even more rapid), and immigration, which will slow ageing down a bit. The data in the above chart come from the US Census Bureau, and it appears to me they have only made a very slight allowance for the impact of migration, which may mean that the ageing curve has not been so steep in the last three or four years, but equally, and despite the fact that population has risen by nearly 2 million since 2003 due to substantial immigration, the retail sales have barely shown an impact (which means I would hate to see what they would have looked like without the immigants). Although, might we postulate the some of the stability we saw in retail sales in 2005 and 2006 could be the impact of the arrival of the immigrants? 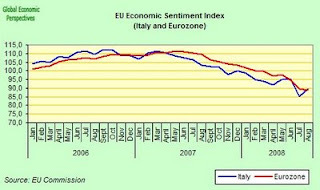 Other indicators also seem to confirm the idea that things in Italy continued to get worse more slowly in Italy in August, one of these was the EU Economic Sentiment Indicator (ESI) which fell in both the Eurozone and EU, falling by 1.9 points in the EU and by 0.7 of a point in the Eurozone, to 86.9 and 88.8 respectively. For the EU as a whole the ESI reached its lowest level since December 1993. However, unsurprisingly, perhaps, in view of all the above, while the ESI fell for the zone as a whole in August, in Italy it bounced back slightly to 89.5 from July's 85.4 low. One of the reasons for this change is undoubtedly the shift in consumer confidence, and one of the underlying reasons for this shift in consumer confidence is the easing in petrol prices and inflation, which fell back to an annual 4% in August from an annual 4.1% in July. It is to be hoped that producer prices, which were up at their highest rate since September 1995 in July - an annual 8.3% - will now follow the same path. There is some evidence of a moderating trend, since month on month, the index rose 0.5% over June compared with a 0.8% increase the previous month. Istat said that energy prices in July surged 25% on the year and 1.6% on the month. The price of refined petroleum products continued to drive the index higher year-on-year, since they were up by an annual 31.1% and 1.2% on the month. Excluding energy, producer prices only rose 4.1% on the year and 0.1% on the month in July. So is it all about energy, well obviously not completely, but it is to some significant extent. Years of declining competitiveness and a complete disregard for the problems that population ageing were going to represent have left the Italian economy completely "groggy", like the proverbial boxer leaning on the ropes, waiting for the knock-out blow. And in it has come, in the shape of an unprecedented and sharp spike in oil prices. Italy is now, as we can see, extremely sensitive to any strongish movement, one way or the other, in oil prices. Thus it seems it may well be worth asking ourselves, along with Professor Bardi, the awkward question of whether Italy's economy can in fact learn to live with oil prices which remain over $100 a barrel in the longer term? The answer is not at all obvious. profits disappear and, eventually, the system must disappear, too, bankrupted. with oil over $100 per barrel? with oil prices over $100 per barrel?